Some collectors might remember Vittorio Gui as the conductor of Victoria de los Angeles's Glyndebourne Barber of Seville, recorded by EMI Classics in 1962 and still available on CD in their "Great Recordings of the Century" series. He was born in Rome in 1885 and died in Florence in 1975 – another example of longevity among classical conductors! One of the joys of material released by ReDiscovery is how much "face" it has. The past several decades have seen interpretations and orchestral sound becoming increasingly homogenized. Orchestras in Moscow and Minneapolis sound almost the same, and Conductor A's "Eroica" is virtually indistinguishable from Conductor Z's. In a highly-competitive field, I'd be hard-pressed to say that any of Gui's "warhorses" are the best that ever galloped across the stereo soundstage. Even so, Gui and his orchestra obviously gave these recordings their all; there's nothing automatic or dutiful about this music-making. Gui was referred to as "a young Toscanini" – he was 18 years his junior. In some ways, though, Gui compares favorably to Toscanini (less tense, more flexible), and in other ways, perhaps less favorably. 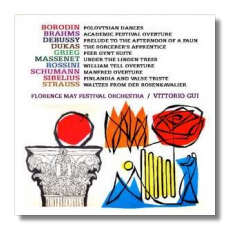 (Toscanini probably would have cracked his whip over the sometimes coltish playing of the Florence May Festival Orchestra.) Gui's Academic Festival Overture is even less Germanic than Toscanini's, and his Schumann Manfred burns with an even more Mediterranean flame. This is not necessarily a bad thing! Toscanini was far too serious to be effective in Dukas's Sorcerer's Apprentice; Gui finds the fun that rubs shoulders with the menace in this wonderful work. His conducting always smiles. True, his orchestra doesn't have the best chops. The violins are thin, and there are several moments of questionable intonation. Why complain, though? This is music played by real people, not by conservatory graduates with the souls and motor skills of robots! A curiosity: although the Rosenkavalier Waltzes are credited to Gui and the Florentines on LP, the tape identifies the performers as conductor Gustav Cerny and the Graz Philharmonic Orchestra. Either way, the performance is idiomatic, with a spirit of fun taking the place of a high technical polish. ReDiscovery releases are available over the Internet at www.rediscovery.us; their service is fast and courteous. The asking price for this two-CDR release is only $20, and that includes shipping and handling. The releases look endearingly homemade - no labels on the CDRs apart from a handwritten catalogue number near the spindle hole, and rudimentary (yet effective!) cover art and release notes – but the digital remasterings are superb, and the performances themselves are anything but generic.